Fifth wheel trailers are a popular way of RVing, for both full-time and part-time RVers. 18 percent of all towable RVs shipped in 2017 were fifth wheel, an increase of 16.9 percent from previous years. When you finally arrive at your destination, you can simply unhook your truck for trips into the wilderness or to hit up the local Walmart. From the lighter models, at about 2,400 pounds, to the super heavyweight at 20,000 pounds, there are many “average” weights. Let’s take a look at the various classes of fifth wheels, with some examples of their weights. If all fifth wheel trailers were the same size and offered the same facilities, guessing an average weight would be easy. Like all types of RVs, though, it becomes more difficult with the different classes of fifth wheel trailers you can buy. There’s no official classification system, but this is how most manufacturers will break it down. The main benefit of a lightweight fifth wheel will be the saving in fuel costs you will make. Towing a lighter vehicle will allow you to travel further or spend longer at your eventual destination. You can even save money on the truck you need to use, with lightweight fivers only needing a half-ton pickup truck to tow. Lightweight doesn’t have to mean tiny and cramped. Although they may be more compact, a choice of floor plans can still offer spacious accommodations. A fifth wheel classified as “lightweight” can often be up to 30 feet long and weigh a maximum of 9,000 pounds. A prime example of luxury in an ultra-light fifth wheel trailer is the Scamp 19-Foot Deluxe. The largest of the Scamp range, this fifth wheel provides a queen-size loft bed and extra sleeping space for up to six people. With a wet-room bathroom, kitchen facilities and plenty of storage space, it still only weighs 2,400-2,900 pounds. Allen Camper 2690RETS, 27 feet, 6,500 pounds. Escape 5.0TA, 21 feet, 3,885 pounds. Jayco Eagle HT 24.5CKTS, 29 feet, 7,460 pounds. For those who want significantly more space, a mid-size fifth wheel trailer can provide a 30 to 40-foot length. Of course, they will also weigh more, at 9,000 to 14,000 pounds, and need a vehicle with at least a ¾-ton towing capacity. Using a 1-ton truck to tow a mid-size fifth wheel should provide the driver with more control and a smoother ride. A mid-size fifth wheel is more likely to feature slide-outs for extra space, full-sized refrigerators, and professional countertops. Upgraded furniture, larger water tanks, and a king-size bed will all add to the longer length and greater weight. The Grand Design Reflection 337RLS is a typical mid-size RV, with a length of 35.6 feet and a weight of 10,570 pounds. Looking more like a Class A motorhome on the inside, it features two slide-outs to the rear, for even more space. Inside the bottom level, you will find a fireplace, full kitchen, and dinette, with central work surfaces and sink, and a home entertainment area. 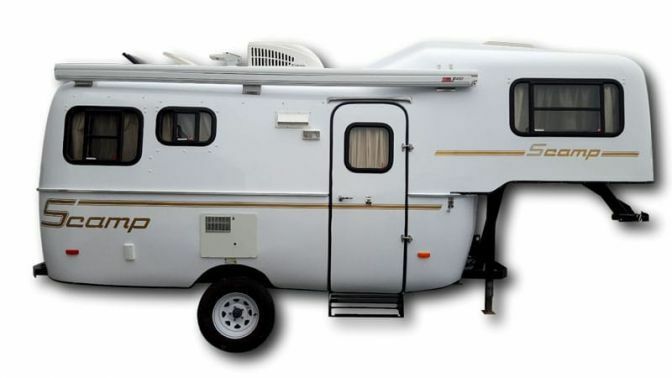 Mid-size fifth wheel trainers, like the one above, often place the bathroom on the upper level, like an ensuite next to the main sleeping area. The extra space allows for a proper shower cubicle rather than a wet-room style, and extra sink facilities. There’s even room for a dresser and wardrobe storage area in the loft-style bedroom. Manufacturers of mid-size fifth wheel trailers include Heartland, Highland Ridge, and Keystone. Keystone Montana 3121RL, 35 feet, 11,895 pounds. Heartland Pioneer 355, 39.8 feet, 11,010 pounds. Highland Ridge Mesa Ridge MF374BHS, 40.6 feet, 12,300 pounds. Those RVers who like to “glamp”, otherwise known as “glamorous camping”, will appreciate the full-size or luxury style of fifth wheels. Luxury fifth wheels can range in weight from the 11,000-pound trailers to the heaviest, weighing around 20,000 pounds. The length can often stretch all the way up to 45 feet. The extra space offered by these luxury trailers allows for additional features, like residential appliances and immersive entertainment options. Higher ceilings, upgraded insulation, and a larger master bedroom and bathroom facilities, could make you forget you are in an RV. One of the heaviest luxury fifth wheels we came across was the DVR Elite Suites 44 Nashville weighing a staggering 20,600 pounds. The extra space above the bed of your truck can be used as an indoor theatre, with seating for up to eight people. At the rear of the trailer is a large bathroom, including a bath and the master bedroom. The middle section features the kitchen, and dinette facilities with slide outs. Redwood Cruiser CR3771MD, 41 feet, 12,324 pounds. KZ Durango Gold G382MBQ, 40 feet, 13,330 pounds. Jayco Pinnacle 38REFS, 42.8 feet, 13,685 pounds. Sometimes you want to take your “toys” on the road with you to make the most of your outdoor experience. These could be motorbikes, ATVs, golf carts or kayaks, to add to your holiday fun. A garage at the back of your fifth wheel with a ramp-style door makes it easier to load and unload. Toy hauler fifth wheels have become a class of their own, ranging in length from 33 feet to 45-foot trailers with a garage at the back. They will normally have a dry weight of around 10,000 to 16,500 pounds, but remember they will be significantly heavier when loaded with motorbikes or other vehicles. 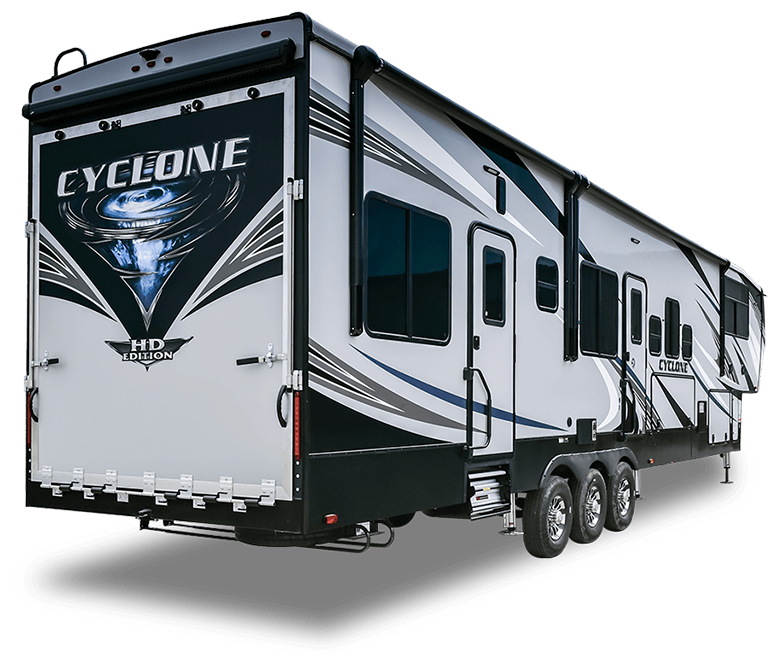 Heartland RVs features a whole range of toy haulers, including the impressive Cyclone series. The Cyclone 4005 toy hauler fifth wheel boasts a 13-foot garage, sleeps seven people and has a dry weight of 16,730 pounds. With a length of 44 feet, it features three sliding compartments and a ramp door at the back for easy loading and unloading of your cargo. There’s even an extra loft space above the garage which can be used as a seating or sleeping area, large enough for a queen bed. Dutchman Voltage 3605, 39.1 feet 13,673 pounds. Palomino Puma 381FTB, 39.2 feet, 14,123 pounds. Forest River 37TSX13 XLR Boost, 39.9 feet, 12,687 pounds. What Do the Different Weights Mean? To tow a fifth wheel trailer safely, you’ll need to check the tow rating of your truck and the hitch-weight capability. You need to ensure the hitch can cope with the load placed on the suspension of your truck. There’s no extra benefit taking a separate vehicle for use when you arrive at the campsite if it’s been overpowered by your fifth wheel trailer on the way. This is the weight your vehicle arrives with from the dealer or manufacturer, and includes the axles of the trailer and hitch weight. Cargo Carrying Weight (CCC): The amount of weight that can be carried in cargo, fresh water, and other accessories or equipment. Gross Axle Weight Rating (GAWR): The maximum weight, including cargo, that can be supported by the trailer’s axles. Gross Vehicle Weight Ratio (GVRW): This figure includes the hitch weight and the total weight of the trailer’s capacity, including any cargo, pets, or passengers in the back. The following short YouTube video goes into more detail on how you can determine if your truck has enough grunt. It would be a complete downer to set your heart on a fifth wheel trailer, only to find your truck isn’t powerful enough to tow it. We hope you enjoyed our attempt to lay out the average weight of a fifth wheel trailer. We didn’t mean to bamboozle you with so many figures, it’s just that there are numerous different fifth wheel trailers out there. If pushed, we would have to say the average weight of a fifth wheel trailer is between 12,000 and 15,000 pounds. This would include trailers in both the mid-size and luxury classes, with a few of the toy haulers too. Whether you like the feel of a tiny home or prefer a larger living space, you can find all your home comforts in a fifth wheel trailer. If you have any tips or stories to add, or just want to ask more questions, we’re waiting to hear from you in the comments below.